It’s been a busy season so far for the Owls, as they close in on the home stretch of their 2008-2009 season. 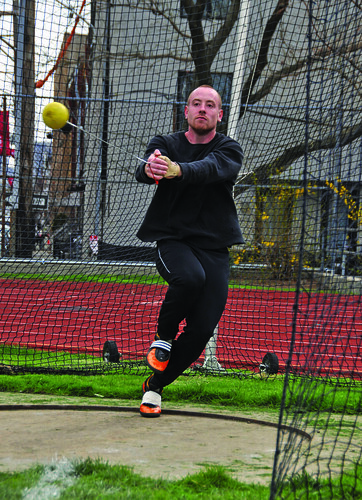 Bob Keogh practices the hammer throw last week at team practice. Keogh placed seventh in the hammer throw at the Florida Relays last weekend in Gainesville, Fla (John Mehler/TTN). With the season halfway over, the men’s and women’s track and field teams are looking to sprint to the finish and hurdle over their opponents to win the Atlantic Ten Conference title. On April 3, part of the track team traveled to Gainesville, Fla., for the Florida Relays, while the rest of the squad stayed in Philadelphia for the Penn Invitational. In Florida, senior thrower Amanda Cole took fifth place in the hammer throw when she threw 175-05. For the men, sophomore thrower Bob Keogh finished seventh in the same category. Keogh’s throw of 185-11was his best to this point in the outdoor season. In the 400-meter dash, sophomore sprinter Paris Williams was the 10th-best collegiate finisher (16th overall), as she clocked in at 55.04 seconds. For the men, junior hurdler Brad McFadden also finished 16th overall with a time of 53.55 seconds. In the high jump, junior hurdler/jumper Joshua Louis represented the Cherry and White, finishing 13th overall and clearing 6-8 3/4. The Owls’ relay teams also made their marks in the sunny state of Florida, with the women’s 4×400 team taking the best finish of the day. Sophomore sprinters Tashima Stephens, Assata Cowart, Paris Williams and junior sprinter Carlleen Allison led the 4×400 team to a time of 3 minutes, 44.06 seconds, giving the Owls a 15th-place finish. In Philadelphia for the Penn Invitational, the weather was not as great as it was in Florida, but the Owls’ performances didn’t suffer. Sophomore sprinter Tariq Lee was the Owls’ top finisher in the 400-meter dash with a time of 51.30 seconds. Freshman thrower Eric Brittingham took fifth place in javelin with a throw of 175-09. For the women, junior thrower Daisy Amato also finished in fifth place in the javelin with a toss of 118-06. In the 3000-meter event, sophomore middle distance runner Clarke Hunt completed the run in 10 minutes, 29.80 seconds, which was good enough to land him a 15th-place finish. Sophomore distance runner Brianna Linneman took a 22nd-place finish in the 5000-meter run with her time of 20 minutes, 15.15 seconds, while freshman hurdler Kayla Mayhew finished 21st in the 100-meter hurdles with a time of 16.09 seconds. With a lot of underclassmen running the show, Mobley wants to keep building for the future. The Cherry and White will hit the track again in Bethlehem, Pa., this Saturday when they take part in the Greyhound Invitational. Also coming up in the near future for the Owls are the Penn Relays, which will be held April 23, 24 and 25 at Penn’s Franklin Field. John Mehler can be reached at john.mehler@temple.edu.